The building designed by Atxu Amann, Andrés Cánovas, Nicolás Maruri is essentially a cover protecting the remains of a Roman assembly (thermal baths, forum and domus) in the archaeological site of Molinete Park in Cartagena, Spain. This cover is certainly another piece in the urban area of Cartagena whose main architectural challenge is to reconcile very different architectures, from the roman times, passing through baroque to contemporary architectures, making them vibrate together in the neighborhood. It is a transition element, between very different city conditions, in size and structure, from the dense city centre to the slope park. The primary goal of the project is to respect the existing remains, using a long-span structure, which requires the least amount of support for lifting the cover. 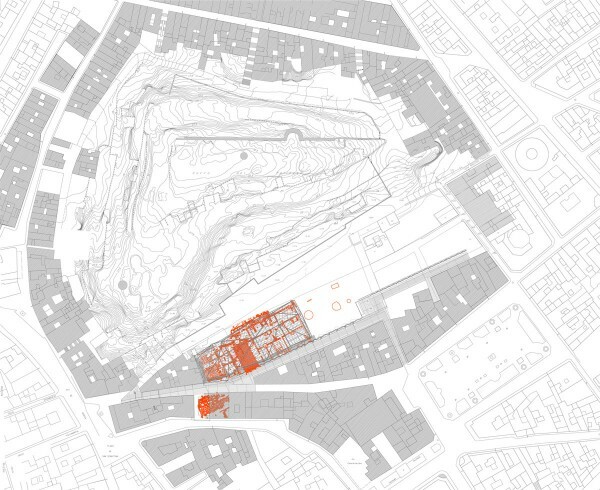 The intervention unifies all the remains in a single space, allowing a continuous perception of the whole site. The cover also generates a new urban facade in the partition wall. The project also pursues a sense of lightness and is conceived as an element that allows light. 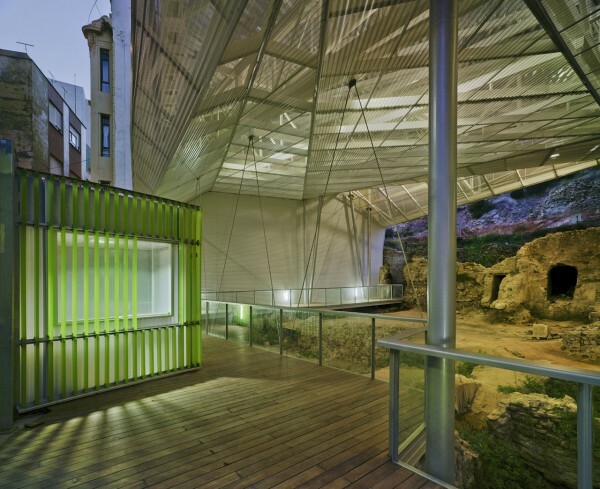 The inner layer is built with a modular system of corrugated multiwall translucent polycarbonate sheets. The outer layer, constructed with perforated steel plates, qualifies the incidence of light and gives a uniform exterior appearance. Besides to the steel structure, the project proposes an elevated walkway parallel to the street. It is a very light structure hanging from the steel beams. Conceived as a glass box, with a faceted, partially visible geometry, it builds the street façade and allows a view of the ruins from three meters height. It is also accessible for disabled visitors. This high path permits an overall vision of the roman remains.